Several Republican leaders of Congress released a new health-care reform plan late last week, a move which is the first substantive policy volley of the new Congress in the ongoing battle over Obamacare. The plan proposes to do what Republicans promised in the lead-up to the mid-term elections: repeal the Affordable Care Act, the president’s signature domestic policy achievement. The proposal—put forward by Sen. Richard Burr (R, N.C.), Sen. Orrin Hatch (R, Utah), and Rep. Fred Upton (R, Mich.)—indicates that the GOP has the broad outlines for a market-based reform but is still far from settling the details. The House has already voted this Congress to repeal Obamacare, but the odds that this repeal-only legislation will make any headway in the Senate are slim. Repealing Obamacare without any kind of replacement would mean taking insurance from millions of people—a move that would cause a political uproar. The new outline is the latest in a series of replacement proposals offered by the GOP, extending back to before the Affordable Care Act was first passed. "Our proposal will not return to the failed policies that existed before the president’s health care law," the congressmen write in their proposal. While the proposal is quick to denounce Obamacare itself as a failure, the law maintains several of the law’s changes, such as allowing children to stay on their parents’ health insurance plan until they are 26 and preventing health-insurance companies from charging more for pre-existing conditions. This plan could be the first in a series of proposals coming from the majority Republican Congress leading up to the Supreme Court’s pending resolution, likely in June, of a lawsuit that threatens to gut the president’s law in about 35 states. The lawsuit concerns the legality of federal insurance subsidies in states that refused to set up their own exchanges. If the Supreme Court strikes down the law and Republicans do not have a replacement ready, they could be blamed for taking insurance from millions of people. Obamacare gives individuals who make under a certain income a subsidy to buy insurance on the insurance exchanges. The goal is to make insurance affordable to more people and increase access to the health-insurance market. These subsidies are tied to the cost of insurance, and the result is that the insurance industry does not have as much of an incentive to keep their prices low. If insurance prices rise, the subsidy grows too. The new GOP proposal wants to use a tax credit to make insurance affordable to more people. But the plan also wants to tie any growth in the tax credit to inflation, not to the cost of insurance. The price of health care has risen much more rapidly than overall inflation over the past few decades. This structure ends what is effectively an open-ended handout to the insurance industry in Obamacare and will put more pressure on insurance companies to try to keep the overall cost of health care low. The GOP plan uses the tax credit to increase access and put downward pressure on costs. There remains a question as to whether Congress would have the strength not to raise the size of the tax credit in line with the rising cost of insurance. Congress has increased the size of Medicare payments repeatedly, even though legislation exists to try to keep them down. Much of the expansion in the number of insured individuals under Obamacare comes because of the law’s expansion of Medicaid, the government-run insurance program for the poor. 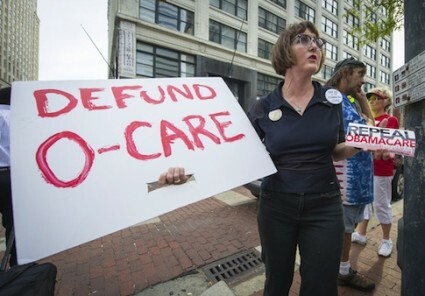 Obamacare does not make any attempt to reform Medicaid, which has myriad problems. Instead, it simply expands this government-run insurance—a sign, perhaps, of the law’s overall intent. This GOP plan would undo the Medicaid expansion by repealing Obamacare and offers reforms to Medicaid. First, it seeks to cap the amount that states get from the federal government for their Medicaid programs (framing it as "financial certainty"). It then says it will give states "programmatic flexibility," which would let the states have more autonomy to run their Medicaid programs as they want, with only reporting requirements and certain metrics they have to meet imposed by the federal government. Many states, such as Indiana and Michigan, have sought to innovate on how Medicaid is run, and this law would allow even more of that kind of state-level experimentation. The law also fixes a major problem with Obamacare. The insurance subsidies under the current law extend only down to those who make about 138 percent of the poverty level, meaning that adults who make under the poverty level but do not qualify for Medicaid (in those states that have not expanded it) do not get a subsidy to buy private insurance, either. The GOP proposal would extend the tax credit to everyone who makes under 300 percent of the poverty level, even if they qualify for Medicaid. One of the biggest problems with Medicaid is that it is separate from and inferior to the system of private insurance that most people have. By extending the tax credit to everyone, this proposal promises to integrate the poor into the broader health-care system. The proposal completely ignores Medicare, one of the biggest single players in the health-care world and a big driver of the rising cost of health care in this country. A proposal from 2009 put forward by Burr, then-Sen. Tom Coburn (R, Okla.), and Rep. Paul Ryan (R, Wis.) proposed moving Medicare to a private-insurance based system with subsidies. This omission indicates that Republicans are having trouble rallying behind the most obvious conservative reform to one of the biggest problems in our health-care economy. The political hurdles to pushing a "premium0-support" reform must be high. The proposal also dies not radically reform the tax code’s treatment of employer-sponsored health insurance. The tax code treats the cost of insurance for employees as untaxable income, which encourages employers to give ever-more generous insurance packages to their employees as a way to pay them more. This tendency encourages the use of health-care services, which pushes up the cost of health care overall. This new plan caps the amount that employers can spend tax-free on insurance benefits, but the limit is quite high—roughly three to six times bigger than the size of the tax credit that the proposal expects many people to receive, a credit that is designed to cover the cost of a very basic insurance plan. As a result, the cap seems unlikely to cause much disruption in the employer-sponsored system—which is likely the point. This change is necessary to stop the open-ended subsidy to employer-provided insurance, but it is ultimately a minor step. The measure is quite similar to the "Cadillac tax" on expensive health-insurance plans in Obamacare—a point that only underscores the fact that this plan does what the Affordable Care Act tries to do, only through conservative means. It outlines the creation of a true market, and relies on principles of federalism and competition to increase access and decrease costs. Updated, 3:40 PM. : Due to an editorial error, an earlier draft of this article was published rather than the final edited version approved by the author. The piece has been updated accordingly.